Fast50s Front Fork Springs for the Honda xr/crf70 and some replica models. 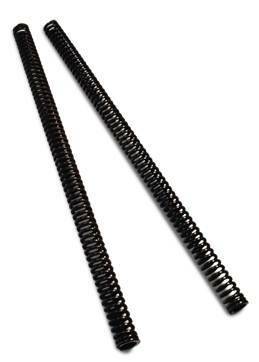 These fork springs are made of the highest quality chrome silicone to ensure long life and hours of fun. They raise the front end up 1 inch making your bike handle all the rough stuff far better than the OEM springs. Approx. 30% stiffer. Great for riders 150+ lbs. Most serious minibike shredders change their fork oil when replacing to Fast50s springs. 75-150 lb rider - 10 weight fork oil with springs out and forks collapsed, oil level 4 inches from the top of the stanchion tube. 150+ lb rider - 20 weight fork oil with springs out and forks collapsed, oil level 4 inches from the top of the stanchion tube.